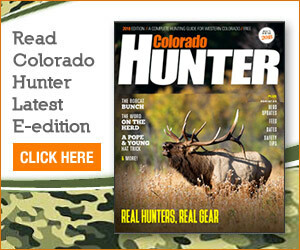 My husband Ron and I had been Colorado Division of Wildlife hunter education instructors for over 20 years. We have had many students pass through our classes over those years. We taught many aspects of safe hunting and shooting, but it all boils down to three main rules: Treat every firearm as if it were loaded, always control the direction of the muzzle and keep your fingers out of the trigger area until you are ready to shoot. We also had the classes go over the Ten Commandments of Safe Hunting and Shooting until they were very familiar with them. One of our students took all of this information to heart and gave his parents quite a lesson. His mom related his first hunting experience to us. This young man was twelve years old and had gotten his very first youth hunting license for an antelope. His mom and dad took him out to hunt on the opening morning of antelope season. He appeared to be very anxious but also very cautious about hinting his first time. The group found a good spot and saw several antelope within range. But the young man did not shoot. As his dad encouraged him to take a shot, the boy told him that he was not comfortable with backstop — it was too far away and he did not feel it was adequate. When they found another small herd of antelope that afternoon, the boy said that the antelope were not facing the “right” direction for a good, clean shot. The next day, they spotted another herd of antelope, but they young man was not comfortable with the distance that he would have to shoot. He had practiced at 100 to 150 yards and was accurate from that distance, but these animals were 200 or more yards away and he did not want to wound an animal or miss completely. Finally on the third day, this young man had everything going for him. He found an antelope within his accurate shooting range, about 100 yards away, standing broadside with a good backstop of a hill behind it. It was a proud moment for him, his mom and dad, and his instructors, also.